The Showcase is like one big buffet. But with Reno now in the rear-view, the NBA Development League prospect scene takes on a far different look. Check out the updates to the NBA D-League menu with in the newest edition of the Prospect Watch. Edwin Ubiles wrapped up the 2010 Portsmouth Invitational with his draft stock skyrocketing. Then he found out about the injury. Now, after spending the entire 2010-11 season off the court, the Dakota Wizards' star guard has more than made up for lost time. Ben Uzoh of the Rio Grande Valley Vipers was today named NBA Development League Performer of the Week for games played Jan. 16-22. Uzoh averaged 22.3 points, 8.3 assists and 7.3 rebounds in 37.0 minutes, shooting 66 percent from the floor. Blake Ahearn broke the record for consecutive free throws made record by sinking his 98th consecutive free throw on Sunday. Was this email newsletter forwarded to you? 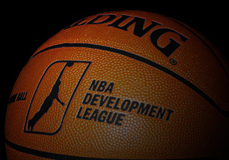 Sign up to get your own free copy of the NBA D-League Newsletter. This message was sent to you because you subscribed to this NBA D-League email newsletter. Update your email address, favorite team or other preferences at the All-Access Member Center.